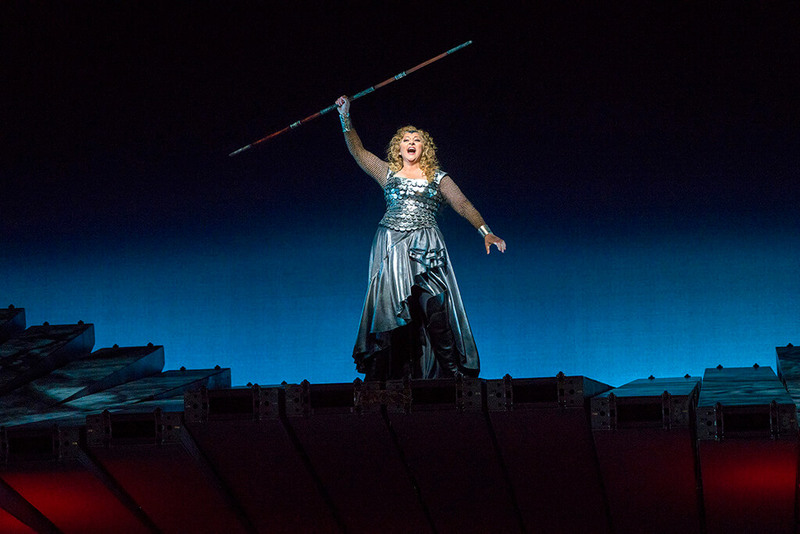 Wagner’s Ring Cycle returns at the Met LIVE in HD starring Christine Goerke as Brünnhilde. Her children call her Momma-Tiger; her Twitter handle is HeldenMommy. These monikers are fun, but there’s a kernel of truth. There is something heroic about American soprano Christine Goerke: she is the American dramatic soprano of our time, combining an exceptional voice with a certain well-judged fearlessness in everything she does, on stage and off. We in Toronto had the great good fortune of experiencing her Brünhilde in the revival of the COC Ring Cycle, albeit spread over three seasons (2015-17). It’s a remarkable achievement, not just for the incredible sounds she produces, but for how her characterization touches the heart. I think we Torontonians could be forgiven for sounding just a bit smug — after all, we got her Brünnhilde before everyone else, and that includes the Metropolitan Opera! This Spring, Goerke is finally bringing it to the Met, in three complete cycles plus extra performances (March 25 – May 11). This is a revival of the Canadian director Robert Lepage’s production seen a few years ago. Visually striking and aesthetically light years away from the hugely successful but tradition-bound, representational Günther Schneider-Siemssen production it replaced, the Lepage Ring drew divided opinions at the premiere. This time around, audiences can expect a few technical tweaks to the monumental “machine,” to make it more audience-friendly, in terms of a smoother and silent operation. For those not able to go to the Met to see it in person, Die Walküre, arguably the most popular of the four Ring operas, will be shown in the Met Live in HD series on March 30. We took this opportunity to ask Christine Goerke a few questions, on singing this role at the Met, as well as for a movie audience. When did you sing your first Wagner role? My first experience of your voice was totally different, in Handel’s Iphigenie en Tauride in Glimmerglass, back in 1997. Did you ever think that twenty years later, you would be Brünnhilde? It’s something I’ve been dreaming about since I was 27 when I sang Third Norn [in Götterdammerung] at the Met. I remember getting off the stage after the Norn Scene. I stood in the wings. It was Jane Eaglen. I thought to myself, ‘someday, please, please, please…’ Now, I pinch myself that day is finally here! 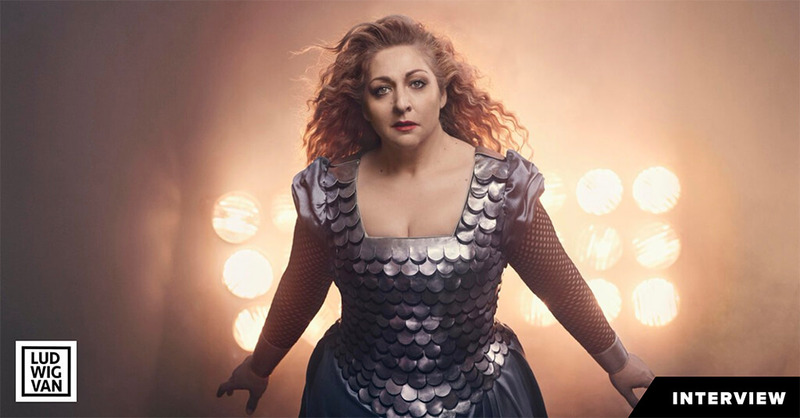 You’ve now sung Brünnhilde in Toronto, Chicago, Houston, Edinburgh, and the Met. Do you find that the way you sing and play the character has changed? Maybe your understanding of this character has changed, or deepened and evolved? Brünnhilde, for me, is a living breathing creature that changes and evolves as surely as you or I do. With every bit of my life lived, I gain new perspective on every character, but there is something very special about her, especially now that I have two nearly teen daughters myself! I will happily admit to channelling some of their energy into my portrayal! How does Brünnhilde compare to the other roles you sing? Sieglinde, Elektra, Senta, Dyer’s Wife, Isolde, Kundry, for example? Well, I suppose the first question I have to ask is — which one?! They are all SO different, and because of that, she is incomparable. I do very much enjoy going on the journey with her throughout all three operas, both musically and dramatically… the growth she demonstrates… it’s inspiring to me. Of the three Brünnhildes, do you have a favourite? And Why? Is there a favourite moment for you in the operas? In Walküre specifically? I couldn’t say I have a favourite, honestly. I have things that I love in each of the three, and things that are challenging in each as well. A favourite moment in Walküre? Funnily enough, it’s likely the moment that most people wait for. The big “hug” moment between Wotan and Brünnhilde… I’m not even singing, and I never make it through that moment without actually crying. I actually apologize to my Wotans ahead of time! Your colleagues in the Met Walküre — Greer Grimsley, Stuart Skelton, Gunther Groissböck, et al. — have you worked with them before? Have you previously worked with conductor Philippe Jordan? I’ve worked with Greer and Gunther before, but it’s the first time I am working with many of my colleagues. Working with Eva Maria Westbroek has been a total joy. Aside from being the most gorgeous singer, she is a wonderful colleague and actress and makes me laugh at every turn. I’m so happy to finally get to work with her! It is my first time working with Maestro Jordan, and I can’t tell you what a great pleasure it is. 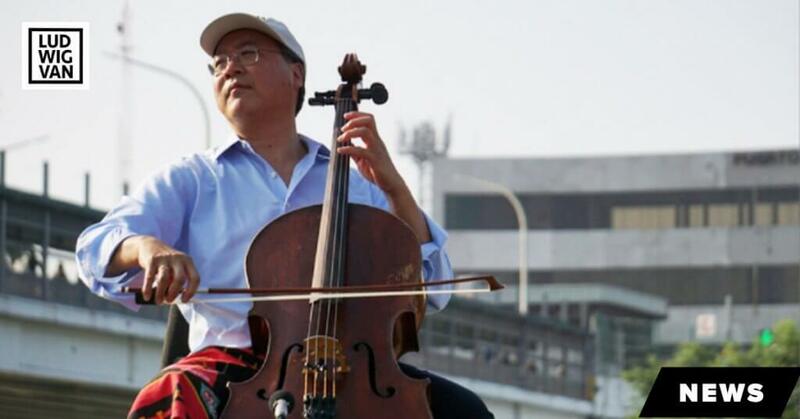 He is a stunning musician and has his eyes on the stage and drama at all times. It makes us feel quite safe — and when we feel safe? We take chances to create art. The Robert Lepage production is known to be physically a little treacherous for the singers to navigate, the last time it was staged. How do you find the set so far? To keep from slipping? Do you wear “sensible shoes” on stage, as Kirsten Flagstad recommends? It actually is not as intimidating as I thought it might be! The “machine” has had quite a lot of work done so that it is quieter, and also has had many new safety measures installed, so I am confident that we will have a great go of it this time around! The sensible shoes are definitely in play: a specialized non-slip lace-up boot helps keep us steady! Now that you’ve sung all three Brünnhildes, give us your thoughts on its vocal and dramatic challenges. What do you like the most about this role? this character? the least? Well, vocally, I find the biggest test to be endurance. 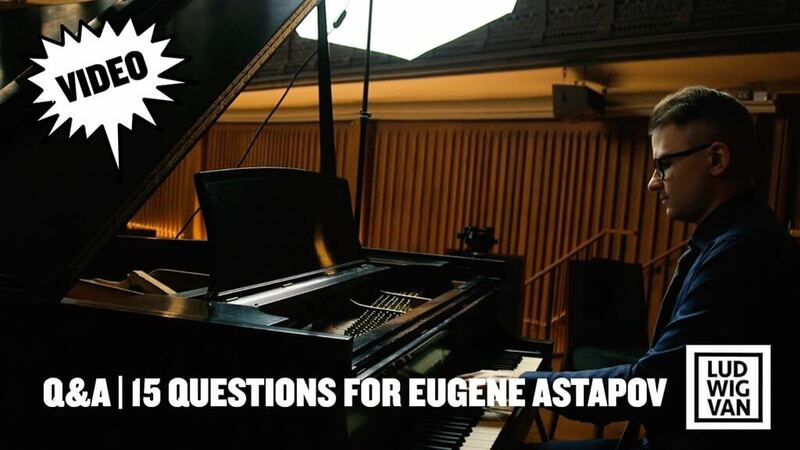 Each of the three operas ask something different of the singer as far as endurance goes, whether it has to do with the tessitura, or the physical and dramatic demands. It’s hard to say what I like most about the role, but I find that she is quite human even before she becomes mortal. I can’t help but find much of myself in this character, which makes her wonderful to play, and also very difficult to look at. I can see her stubbornness in me, I can see her being quick to anger like her father (sometimes like me… eek). I can see her overwhelming desire to do right, without always knowing the best way to go about it. The Met audience, in the 3,800-seat house, will have a very different experience compared to the cinema audience, who will see you with a lot of close-ups etc. Do you do anything different, knowing that there’s an audience in the cinema? Have you sung many telecasts? What are your thoughts on acting for the camera versus for the audience in the house? How do you balance the two? I don’t. My job is not to consider whether or not I am performing for a camera or I am performing for someone who is in a seat one hundred feet away from me. My job is to portray a character, and to deliver the score as well as I possibly can; to take the audience, no matter where they are, on a journey with me. I hope that I will be successful in that, and that everyone will enjoy it! Wagner: Die Walküre. Met Live in HD, March 30, 12:00 p.m., in select Cineplex Cinemas in Canada. Want more updates on classical music and opera news, events, and features that aren’t boring? Follow us on Facebook or Twitter for all the latest.